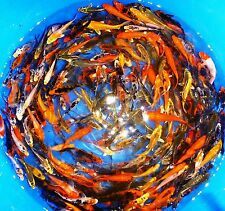 4 Combos Live 12 Goldfish, 12 tadpoles 12 Snails 12 Koi for koi pond garden PKF! THESE KOI HAVE BEEN TANK RAISED AND ARE FEEDING ON AQUAMAX PELLETS. 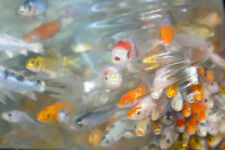 25-LOT LIVE KOI FISH FOR YOUR KOI POND. Quarantine new fish arrivals for a minimum of 2 weeks before introducing them with other older fish at a minimum temperature of 75 degree F.
12-LOT LIVE KOI FISH FOR YOUR KOI POND. 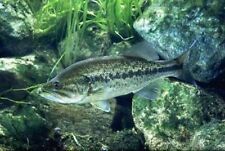 Quarantine new fish arrivals for a minimum of 2 weeks before introducing them with other older fish at a minimum temperature of 75 degree F. DO NOT COUNT FISH WHILE THEY ARE IN THE POND. Live koi fish 8-9" Kujaku. Mature and healthy fish, held and observed in our tanks over a month. Live koi fish 9-10" Shusui Butterfly. Mature and healthy fish, held and observed in our tanks over a month. Mature and healthy fish, held and observed in our tanks over a month. 25 Premium Live Gambusia Mosquito Fish (Koi Pond) Aquarium Feeder Fish Hardy Guppy. -Specs: These are a mix of both male and females mosquito fish. They breed almost 24/7 and reproduce rapidly! Can withstand temperatures as high as 80 degrees and as low as 30 degrees. Live koi fish 8-9" Gin Rin Kohaku. Mature and healthy fish, held and observed in our tanks over a month. Live koi fish 8-9" Sanke Showa. Mature and healthy fish, held and observed in our tanks over a month. Live koi fish 10" Kikokuryu Ghost. Mature and healthy fish, held and observed in our tanks over a month. Live koi fish 11-12" Showa female. Mature and healthy fish, held and observed in our tanks over a month. THESE KOI HAVE BEEN TANK RAISED AND ARE FEEDING ON AQUAMAX PELLETS. 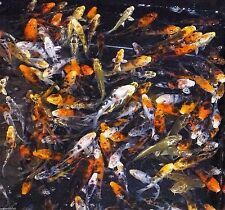 14-LOT LIVE KOI FISH FOR YOUR KOI POND. You will receive your fish alive and healthy. Quarantine new fish arrivals for a minimum of 2 weeks before introducing them with other older fish at a minimum temperature of 75 degree F.
This strict bio-security plan eliminates the possibility of infection or contamination. For us, this is not just a job, it's a way of life. Judging the size of koi by eyesight only can be misleading, especially for butterfly koi. 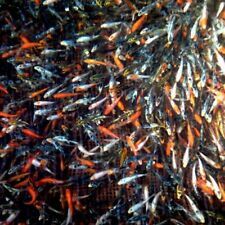 Our fish are healthy, parasite free, and microscopy scraped to be sure they are clean before they are released for sale. We are here to provide you with the best quality koi that have been selected from literally thousands! Mom is a bright orange Ogon imported from Japan. Dad is a prize winning Ginrin Chagoi from Japan. All are standard fin. Small Koi as seen in photo. About 1.5" - 2.0". Just starting to color out. Shiro Bekko. This strict bio-security plan eliminates the possibility of infection or contamination. For us, this is not just a job, it's a way of life. Judging the size of koi by eyesight only can be misleading, especially for butterfly koi. Live koi fish 9" Tancho Showa. Mature and healthy fish, held and observed in our tanks over a month. Taisho Sanke. This strict bio-security plan eliminates the possibility of infection or contamination. For us, this is not just a job, it's a way of life. Judging the size of koi by eyesight only can be misleading, especially for butterfly koi. Platinum Ogon. Yamabuki Ogon. This strict bio-security plan eliminates the possibility of infection or contamination. For us, this is not just a job, it's a way of life. Judging the size of koi by eyesight only can be misleading, especially for butterfly koi. THESE KOI HAVE BEEN TANK RAISED AND ARE FEEDING ON AQUAMAX PELLETS. 12-LOT LIVE KOI FISH FOR YOUR KOI POND. You will receive your fish alive and healthy. Quarantine new fish arrivals for a minimum of 2 weeks before introducing them with other older fish at a minimum temperature of 75 degree F.
Ochiba Shigure. This strict bio-security plan eliminates the possibility of infection or contamination. For us, this is not just a job, it's a way of life. Judging the size of koi by eyesight only can be misleading, especially for butterfly koi. Showa Sanshoku. This strict bio-security plan eliminates the possibility of infection or contamination. For us, this is not just a job, it's a way of life. Judging the size of koi by eyesight only can be misleading, especially for butterfly koi. F ish are health checked daily. Live koi fish 8-9" Kohaku. Mature and healthy fish, held and observed in our tanks over a month. Shiro Utsuri. This strict bio-security plan eliminates the possibility of infection or contamination. For us, this is not just a job, it's a way of life. Judging the size of koi by eyesight only can be misleading, especially for butterfly koi. Beni Kumonryu. This strict bio-security plan eliminates the possibility of infection or contamination. For us, this is not just a job, it's a way of life. Judging the size of koi by eyesight only can be misleading, especially for butterfly koi. Koi fish can make excellent aquarium inhabitants because they are beautiful, sociable, and fun to watch. They live for a long time, so need committed owners. If you decide to begin keeping these delightful companions, affordable koi fish are available on eBay. Koi are freshwater fish and are varieties of carp. They are colored variants, with one very popular breed of koi being the Gosanke type. The Gosanke group includes the Taisho Sanshoku, the Kohaku, and the Showa Sanshoku varieties. They are distinguished by the patterns, colors, and scales, with typical coloration of white, black, orange, yellow, red, blue, and cream. They are primarily kept outside in ponds and water gardens, but in cold weather they may need to be brought indoors and placed in an aquarium. What equipment and supplies do you need for aquariums? Heater - These fish can tolerate temperatures below 40 degrees Fahrenheit and above 80 degrees Fahrenheit, but ideally should have a heater regulating the temperature from 68 to 77 degrees Fahrenheit. Filter - Install an external filter to the aquarium that is rated for the number of gallons in your tank. A carbon filter will help remove toxins and impurities, thus improving water quality. Substrate material - Place a substrate layer for the tank that is two inches deep. Use a mixture of small gravel, larger gravel, and rock pieces. They enjoy sifting through the gravel. Tank - The tank should have one cubic foot per one inch of koi fish length. Multiply the tank's height, width, and length to determine the tank's cubic footage. Lighted cover - Use a cover with a light because koi require 12 hours of light per day. pH stabilizer - The fish require a neutral pH between 7-9. You can add a pH stabilizer to the water if the pH gets too low. Dechlorinator - Use a dechlorinator before adding water to the tank if the water has chlorine. Food - Feed them an amount of food they can eat in five minutes. Where can you keep koi? You can keep koi in a pond outside or in an indoor tank. The water needs to have a pH level between 7-8.5. The water should contain no chlorine, lead, iron, zinc, or copper. A proper pond filter is also required. Make sure the water levels are adequate, with 10 gallons of water for every inch of fish, a minimum volume of 1000 gallons, and a minimum pond depth of three feet. Koi can also be kept in an aquarium, with all the appropriate equipment to keep the water at the correct quality and temperature.